If you recently decided that your commercial property needs a new roof, you will have two options. You will either be able to tear-off your existing roof to replace it with a new one or leave your existing roof on and install your new one over top of it. Here are a few instances in which tearing off your existing roof would be the right option. Your roof will be too heavy if you put your new one over your old one. A commercial roof is, as you might imagine, very heavy. Therefore, you want to be careful about how much weight you add to your commercial structure when you place a new roof on it. The combination of your new roof and old roof might be too much for the structure to take. By tearing off the old one before putting the new one on, you can reduce the amount of weight that your structure will be forced to support. Your roof will be susceptible to moisture trapped between your new and old roofs. Moisture can become a big problem if you place a new roof over an old one. It can get trapped between the two layers, and over time, it can cause the seals in your roof to fail. It can also cause leaks that can affect both your roof and the inside of your commercial property. The only way to ensure that moisture doesn’t get trapped between your roofs is to take your old one off before installing your new one. Your roof will miss out on having certain benefits when you place your new one over your old one. New commercial roofs come jam-packed with all kinds of benefits. They’re more energy efficient than older roofs. They have longer warranties. They’re even usually equipped with weatherproofing technology that makes them better than old roofs. You might not get to enjoy all these benefits when you have a new roof placed over an old one. A roofing contractor can tell you more about which benefits might be missing when you opt not to tear-off your old commercial roof. Would you like to do a complete roof tear-off before replacing your old commercial roof with a new one? 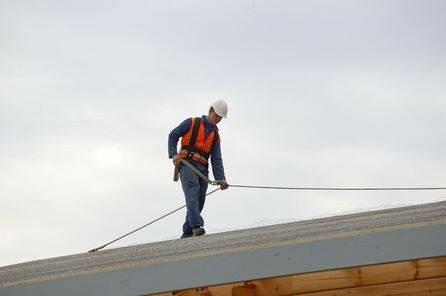 Ray Roofing Supply can get the job done for you. Call us at 330-452-8109 to get rid of your old roof and take advantage of the benefits of a new one.